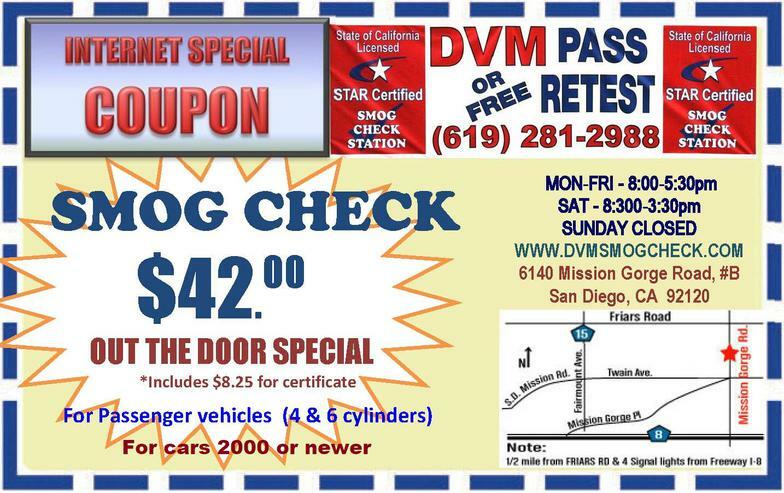 DVM Smog Check and Test Only Station always has coupons and specials available. Call us for more information about current coupons and discounts for your smog check. - Total: $44 OUT THE DOOR for mini VAN's and light truck for vehicles made 2000 or newer. - Total: $55 OUT THE DOOR for all passenger's vehicle’s (4, 6, 8 cylinders) for vehicle’s made 1996-1999. - Total: $60 OUT THE DOOR for heavy duty TRUCK's, SUV’s, VAN's (6000 GVWR and up) for vehicle's made 1996 -1999. - Total: $65 OUT THE DOOR for EVAP TEST for all passenger’s vehicles (4, 6, 8 cylinders) for vehicle's made 1995 or older. - Direct vehicles, please add $2.00 extra "for SMOG CERTIFICATION REQUIRED AT A STAR STATION"
Tired of shopping around? Just print and come in today!! !